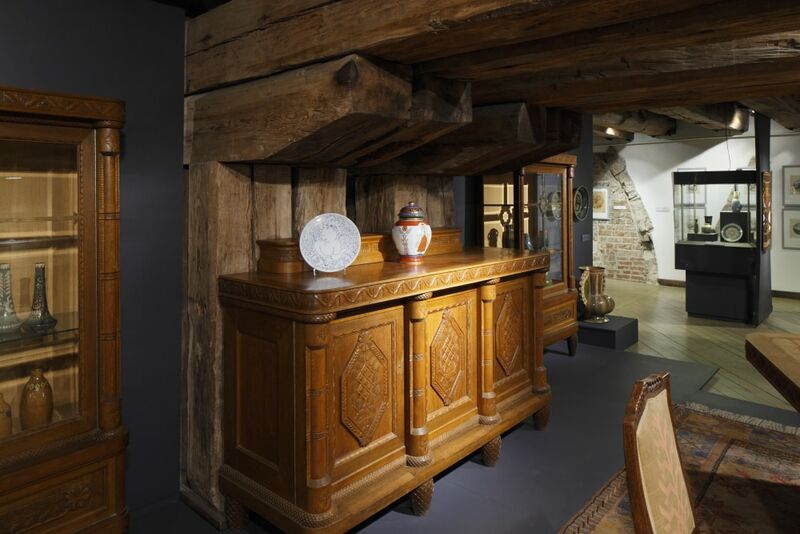 Borrowing its title from a popular Russian fairytale, the exhibition, organized by Kim? 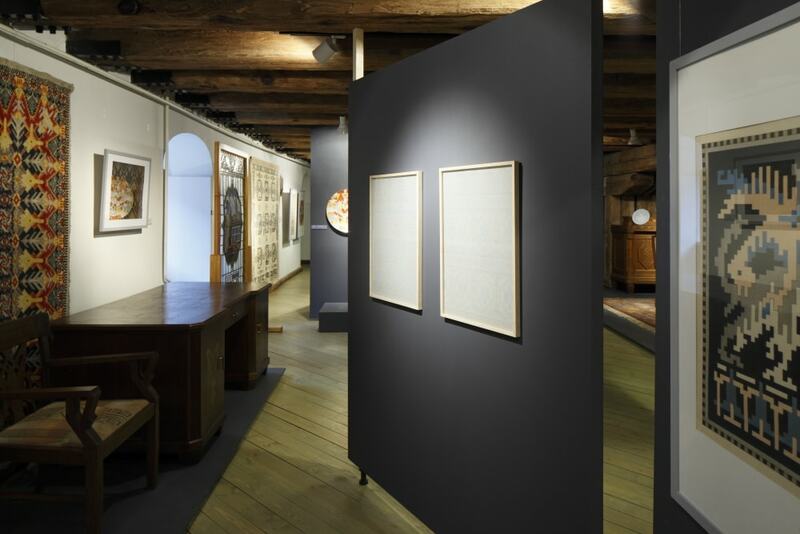 Contemporary Art Centre presents a new series of works by contemporary Moscow-born Israeli artist Alexandra Zuckerman within the unique context of The Museum of Decorative Arts and Design in Riga. 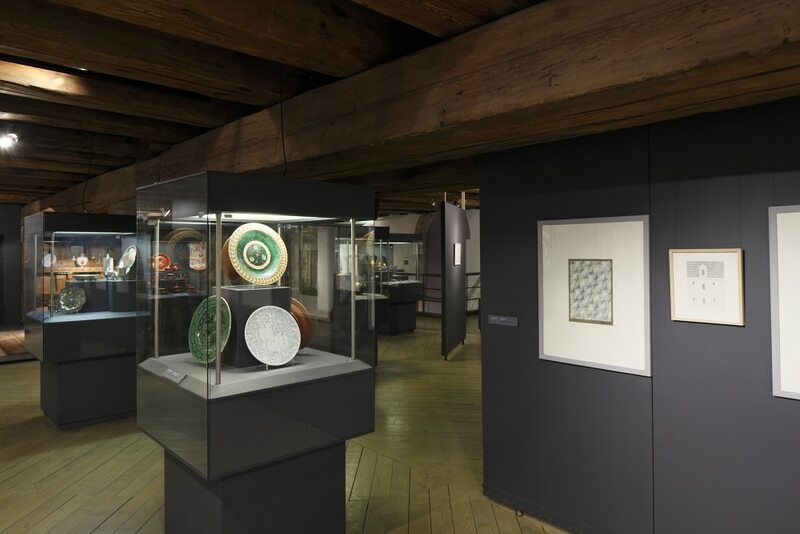 Dispersed within the tight space and cave-like setting of the museum’s second floor, the exhibition is conceived as a sort of archipelago in which every work is isolated and yet in deep dialogue with pieces of respected Latvian modernists ventures in arts and crafts from the 1920s and 1930s. Zuckerman’s slowly developed and detailed works create an imaginative world which is grounded in childhood memories of Russian dachas, Eastern European illustrations and folk art. 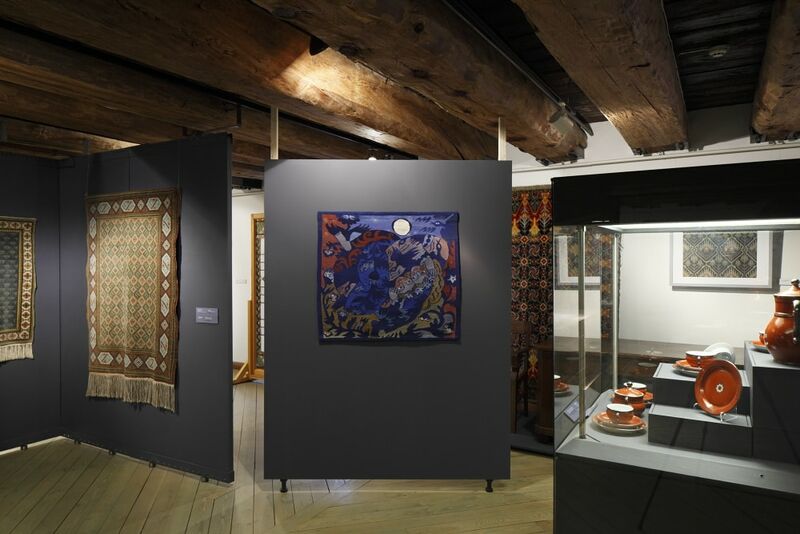 Among the works presented in the exhibition is a new body of blue ink drawings inspired by ornamental painting styles used in many countries of the former USSR, such as Khokhloma, a Russian wood painting handicraft style and national ornament known for its vivid floral patterns. Inspired by the aforementioned style – traces of which can be found in illustrations of Russian fairytales as well as in Natalia Goncharova’s costumes and sets for Diaghilev’s Ballets Russes – is a set of plates displayed in the museum vitrine alongside plates from its permanent collection, depicting female nudes accompanied by drawings of mermaids, crabs and the “firebird.” According to Slavic folklore, firebirds are magical glowing birds coming from a faraway land, bringing both blessings and doom to whoever attempts to capture them. At the core of this exhibition is a quartet of hand-woven tapestries conceived by the artist, commissioned by Kim? 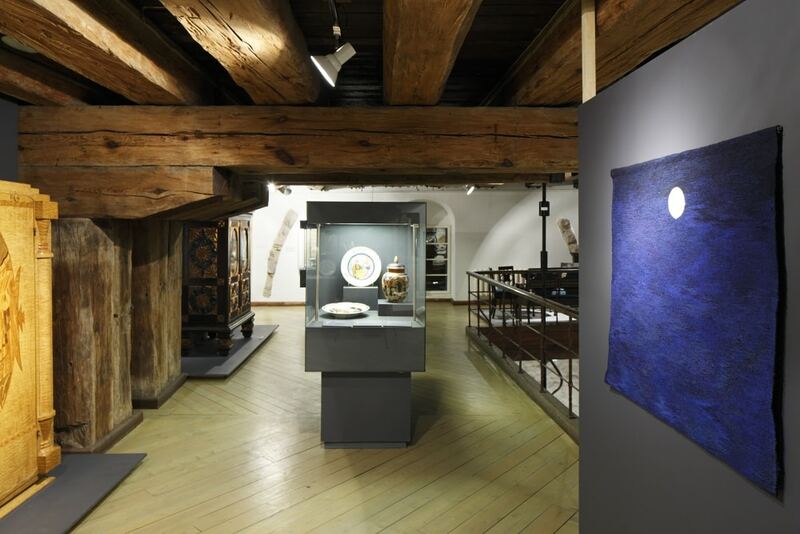 Contemporary Art Center and produced by four local textile artists: Līva Kaprāle, Jolanta Šalvīte, Velga Vītola and Elīna Vojevoda. Displayed in different areas of the museum’s second floor, the tapestries capture two lovers embracing each other and surrounded by birds and flowers at dusk. Due to the commissioning process and conception, each piece has its own distinct technique, reflecting the sensibility of each textile artist. A black ink pen drawing on white paper depicting the museum façade is conceived as a homage to the museum – which follows the language conceived by the artist for her exhibition What the Moon Saw at Noga Gallery of Contemporary Art – as well as two pencil drawings appropriating the style of textile manuals. Featuring flower patterns rendered through the iconic blue-and-red palette on black grid, these drawings encapsulate the artist’s desire to look at tradition, folklore and applied arts as prime materials for the creation of a unique and dreamful universe of which we can only experience glimpses. Alexandra Zuckerman (1981) studied fine art at Bezalel Academy of Arts and Design in Jerusalem and at the Städelschule in Frankfurt am Main, as well as biology at Tel Aviv University. Her works have been exhibited in solo exhibitions at Galeria Sabot in Cluj-Napoca, Romania (2015); MK Search Art in San Giovanni Valdarno, Italy (with Michal Helfman and Eli Petel) (2014); Fruit and Flower Deli in Stockholm (with Lucie Fontaine) (2014); Art Cologne (under the auspice of Galerie Christian Nagel) (2011); Galerie Christian Nagel in Berlin (2008); and Noga Gallery of Contemporary Art in Tel Aviv (2013). Furthermore she has also participated in several group exhibitions such as Susy Culinski & friends at Fanta Spazio in Milan (2015), Filosofen at Galleri Riis (2015), and The Drawing Room at Magasin III (2014), both in Stockholm; A Guide to Making a Genie, at Gallery 427 in Riga (2014); The 1st Herzliya Biennial of Contemporary Art in Herzliya, Israel (2007); As If Words Meant Nothing at kunstbuero in Vienna (2009); and Garbage Man Please Garbage Me at Brun in Düsseldorf (2006). The artist has received the Excellence Award in the Arts from Bezalel Academy of Arts and Design and the America-Israel Cultural Foundation Scholarship. In 2014 she was artist-in-residence at Iaspis in Stockholm. Inese Baranovska, Aleksejs Naumovs, Nicola Trezzi.